The most expensive aspect of raising animals on your homestead is the food that is necessary. If you have chickens that are being raised for meat or eggs, then a lot of feed may be needed. You might be surprised to know that are many ways to save money on chicken feed. All you need to do is determine if any will suit your needs. One reason a lot of products at a supermarket are expensive is due to the cost of feed. This includes the cost of products that are organic. The eggs collected from chickens can actually cost you more than store bought eggs due to the money spent on chicken feed. 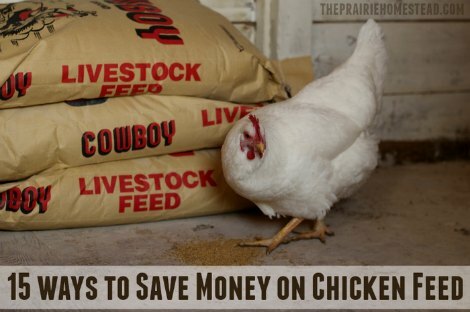 If you can save money on chicken feed, then less money is being spent each month to feed your animals. Many people who rely on feed from a local feed store may get sticker shock at the price. If you spend a lot on feed for your chickens, then look for a various ways to save money on chicken feed. The options that are available may seem like common sense, but might never have been considered. The options you use to save money on chicken feed depend on your specific preference. You may have other alternatives come to mind when you review these various money saving techniques. Another important detail about this process is learning about new feeding methods. One crucial aspect about methods to save money on chicken feed is being self sufficient by growing or using different sources for feed. This may depend on the land available on your homestead. Finding an assortment of methods to be frugal when feeding chickens will provide a lot of benefits.